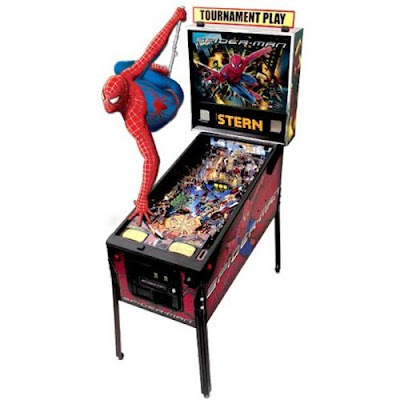 This Stern Pinball Machine, SPIDER-MAN™, was designed by Steve Ritchie, Lyman Sheats, and the engineering staff at Stern Pinball, the pinball machine takes Spider-Man, Spider-Man 2, Spider-Man 3 and puts them all into one fast-paced pinball machine that will excite both operators and homeowners. In the SPIDER-MAN™ pinball machine, you are Spider-Man™. Your goal is to defeat the villains from all three movies: Green Goblin from Spider-Man, Doc Ock from Spider-Man 2, and Sandman and Venom from Spider-Man 3. There are detailed, vibrant toys of each of the four villains on the playfield with an associated shot. Defeat all four villains and experience Battle Royale! The pinball machine offers incredible features, including: Doc Ock's magnet that simulates a "Fusion Malfunction" by holding the ball; Green Goblin hovering on his glider above Pumpkin Bomb targets; Venom's ramp that quickly feeds the ball back to the left flipper; Sandman's whirlwind of targets and a motor 3-bank at the center of the playfield; and a whole lot of amazing multi-ball action. Kevin O'Conner utilized the film’s art resources and created the back glass and playfield art, while Marc Shoenberg and Mark Galvez also worked with the film’s art direction, to produce the cabinet art. The pinball machine has a phenomenal music and a sound package composed and adapted by David Thiel. The game also features stunning dot matrix animations created by Mark Galvez, recapturing key scenes form Spider-Man , Spider-Man 2, and Spider-Man 3. Earning very well and eminently collectable, SPIDER-MAN™ pinball from Stern is a solid and entertaining package that will rock the pinball universe. Kid Tough Digital Camera NO TAXES,LOW SHIP"
N908 phone in Hong Kong..